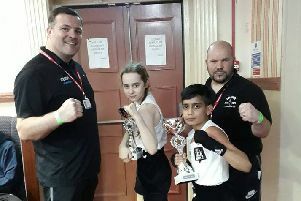 Peterborough Police Amateur Boxing Club fighter Brian Lawless was an impressive winner at a show in Skegness at the weekend. The 19 year-old from Welland stepped in at short notice to take on Thomas Dunderdale from Skegness ABC in a 77kg contest and came away with a points win. “Considering he came in late to fight a guy on home turf, this was a fantastic points win,” said his coach Chris Baker. “It was a close bout in the first and second round, then Brian stepped it up a gear and won the third with ease with awesome power shots to the head and body.